Whether you’ve got one vehicle or an entire fleet, keeping your equipment running in peak condition is our top priority. Transit organizations, trucking firms, emergency service providers and many others have made us their trusted service provider for seamless access to best-in-class technical and maintenance support. TOK Performance is an OEM-franchised repair overhaul dealer and body repair shop. We are experts in repairs and upgrades to both conventional powertrain systems and emerging hybrid and electric technologies. We rebuild powertrains for most heavy equipment applications and will advise you on the most current strategies to enhance your fleet’s performance. 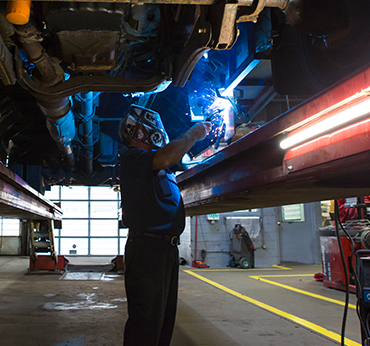 TOK’s highly trained team is dedicated to getting your fleet back on the road fast, then keeping it there. Our in-depth expertise and commitment to staying up-to-date on the latest technologies means we can fix problems other shops can’t. And we’ve developed analytics to develop the optimum schedule for both proactive and preventive maintenance, so you can avoid costly breakdowns in the future. Our wide range of longstanding customers know we stand behind the quality of our work, with no surprises. New alternative powertrain systems and future autonomous technologies mean maintenance is getting more complex. We’ll keep your fleet moving with our modern facilities, full range of in-stock parts, and knowledgeable, customer-service-oriented technicians. Visit our customer service site for more information on how we can help you or contact us to learn how TOK Performance can keep your fleet moving.